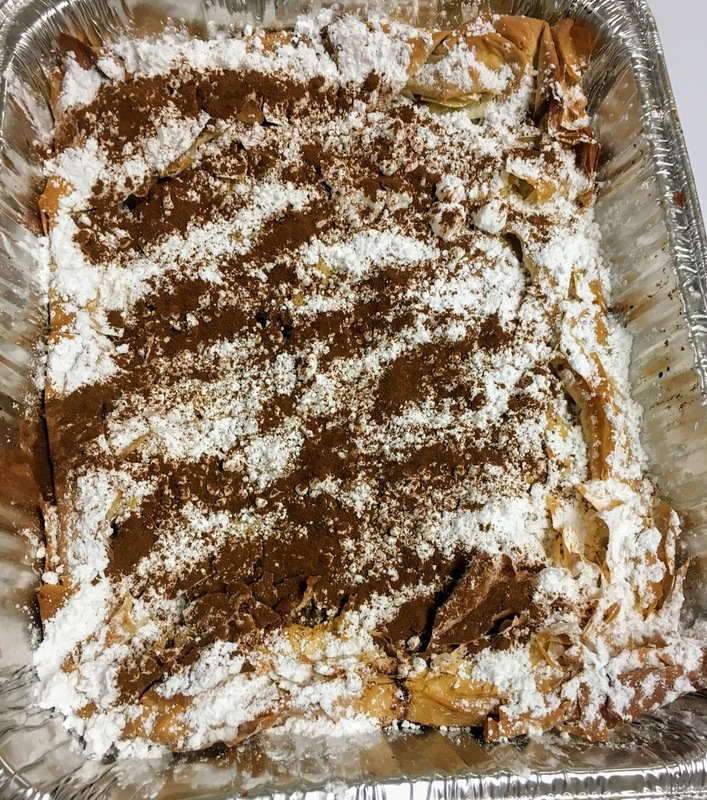 This is my coworker, Maria’s, twist on bougatsa, a breakfast pastry from northern Greece. It has a creamy pumpkin, milk, and semolina filling, and a crust made from layers of filo, a paper-thin dough used in Greek and Middle Eastern pastries. With a generous coating of cinnamon and sugar, it’s sweet enough to eat as dessert in place of pumpkin pie! 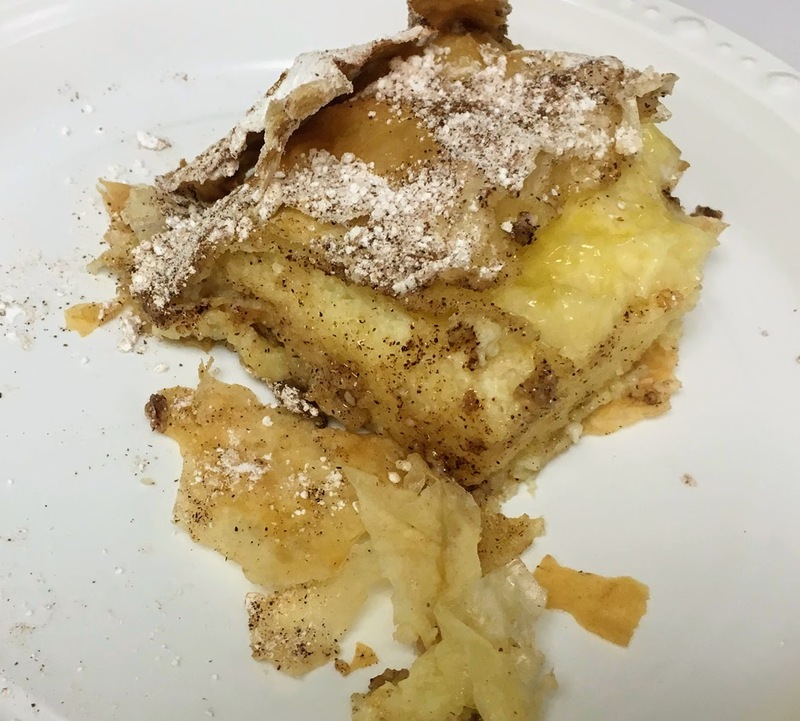 I prepared bougatsa with a group of middle school students during one of my after school cooking classes, and we learned the hard way that filo dough dries out very quickly. Be sure to cover or refrigerate the filo leaves you set aside for the top crust. In a small bowl, combine eggs, semolina, vanilla and lemon; set aside. Bring milk to a boil in a medium sauce pan over low heat . Stir in pumpkin puree. Slowly add egg and semolina mixture, stirring for several minutes until thickened (make sure the heat is very low, so the eggs don’t curdle.) Remove from heat, and set aside to cool. Grease the bottom of a square baking pan with melted butter. Divide the package of filo dough in half, and store one half in the fridge. Stack the first half of filo leaves on the bottom of the pan, brushing the surface of each leaf with butter. Allow the edges of each leaf to hang over the sides of the pan. Bake for 20-30 minutes, until golden brown on top. If oven is spotty, cover the pan with aluminum foil for the first 15 minutes of baking time. Let cool, then dust with a generous coating of sugar, followed by cinnamon. Refrigerate leftovers. Traditional bougatsa, without pumpkin, prepared by the young chefs in my cooking class.